"God gave Nolan the ability to throw a baseball faster than anybody else." The recent rant from Joe Morgan regarding radar gun readings while watching Detroit Tigers rookie fireballer Joel Zumaya placed a spotlight on measuring the speed of fastballs and recognizing the fastest of the fastest. It's a debate for the ages, covering legends Walter Johnson, Bob Feller and Nolan Ryan and continuing to a seeming glut of would-be fastball kings in the game today. "Who throws the fastest?" and "How fast does he throw?" are questions that undoubtedly date to the origins of the game. Baseball Almanac put together an interesting chronicle of "The Fastest Pitcher in Baseball History." The article details a variety of tests to measure fastballs over the years, with Johnson's recorded at 134 feet per second or 91.36 miles per hour. 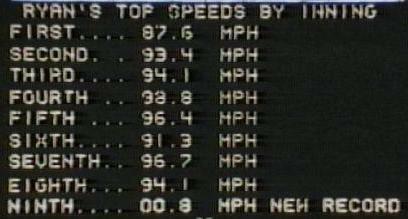 Feller's 98.6 mph entry was achieved using a speeding motorcycle. But Rapid Robert claimed to have been clocked as high as 107.9 in a 1946 demonstration. One of the most famous of the fastball documentation events was Nolan Ryan's official "clocking" at 100.9 MPH in 1974. As the oldest son of George Lederer, the California Angels Director of Public Relations and Promotions, I had an opportunity to play a small role in the event. As the summer of 1974 wore on, the Angels fell ever deeper into the American League West cellar. Attendance figures were taking a similar dive, as weeknight crowds often fell short of 10,000. What's a team to do beyond the scheduled bat nights and ball nights? In this case, the attention was focused on their 27-year-old budding superstar, Nolan Ryan. Acquired from the New York Mets in December 1971, Ryan quickly became known as a strikeout king, recording 329 in 1972 and breaking Sandy Koufax's major league record with 383 in 1973. "He threw the ball harder than any pitcher I ever saw, including Sandy Koufax." Interest in the Ryan phenomenon was increasing and his fastball was quickly becoming legendary. Players generally agreed that Ryan's fastball was the fastest of active pitchers. With that acclaim, the natural questions were "How fast is fast?" and "How does Ryan's fastball compare to the legendary fastballs from bygone eras?" Measuring the speed of a Ryan fastball would be the only solution. At the virtual dawn of what we now recognize as an era of tremendous technological advances, the answer was found just five miles from the then Anaheim Stadium. Dad discovered a team of scientists at Rockwell International -- a part of the aerospace industry that defined much of the Southern California landscape in the post-World War II era -- had developed a sophisticated but untested device that had the potential to accurately measure the speed of a Nolan Ryan fastball. In August, as the quest to make an official clocking of Ryan's fastball was developing behind the scenes, Ryan was adding to his legend on the field. Following a 30-day period in July when he totaled 57 2/3 innings, Ryan began an incredible streak on August 7 in a game against the White Sox in Chicago. He entered the ninth inning seeking to throw his third career no-hitter but lost it and the game as the Sox managed three hits to produce two runs and a 2-1 victory. His 13-strikeout performance was followed by games with strikeout totals of 19, 9 and 19 -- 60 strikeouts over a stretch of four starts. "He's faster than instant coffee." Meanwhile, on an asphalt parking lot at the Rockwell International facility in Anaheim, the Rockwell engineers sought to test their device in a dry run before taking it to the stadium for an upcoming Ryan outing. My father arranged for Angels catcher Charlie Sands, a disabled list victim for much of August, to assist in the test by catching a 22-year-old lefthander whose fastball would be the subject of the trial procedure. I was that lefthander. Although I had enjoyed success as a pitcher -- my high school career ended by winning the Southern California large schools championship and I played a summer for the Anchorage Glacier Pilots, a collegiate league team that included future major leaguers Randy Jones, Craig Swan, Jim Crawford and Bruce Bochte -- I was two years removed from my last competitive season. Following a sufficient warm up on the moundless parking lot, the engineers announced that they were having trouble getting a reading. They explained that they didn't expect to have any trouble getting a reading on pitches that were at least 85 miles per hour. Upon hearing that, Sands could barely suppress his laughter. I clearly remember the incredulity in his voice as he said, "If this guy could throw 85 miles per hour, he wouldn't be out here pitching in the parking lot." So much for that career. Attention for the project then turned to conducting the test during an upcoming home start for Ryan. If successful, an official clocking would be announced and turned into a promotional opportunity for a subsequent start at the Big A. "We created a monster," groaned George Lederer of the Angels. He is the club promotion director in charge of the celebrated Nolan Ryan test and contest . . . The fireballing right-hander's speed will be measured Saturday night at home against the Chisox . . . Prizes are up for people guessing the right m.p.h. and number of pitches Ryan will make. Entries approach the 6,000 mark. Three secretaries have worked around the clock the past week checking the estimates . . . The Angels have heard from 250 communities in California as well as 20 other states, including New York, Minnesota and Connecticut. Low guess is 48 m.p.h. . . . High 147.3 . . . One entry estimated only six pitches. Another said 358 (Ryan's average is 150 and he's made as many as 245 in nine innings) . . . "We never realized how much attention this would attract," sighed Lederer. A device called a coherent infrared radar, developed by Rockwell International, will measure the velocity of Ryan's fastball. Other devices have clocked nine other major league fireballers and the fastest of the nine was Bob Feller, at 98.6 m.p.h. in 1946. The Cleveland star was 27, Ryan's age now. But the comparison will be exact. Rockwell International calls its device the most sophisticated ever used to measure the speed of a thrown baseball. The machine will operate from the press box, making use of a phenomenon called the Doppler frequency shift. The infrared beam from a low-power transmitter is aimed at a spot 9 or 10 feet in front of home plate. Because infrared wave lengths are 20 times longer than those of visible light waves, the beam cannot be seen. As the ball crosses the beam, the waves are compressed by the motion of the ball and reflected back to the equipment. The returning waves have less spacing between them than when they were transmitted. The device measures that difference to determine the ball's speed. There's no guarantee that Ryan's fastest pitch will be timed. The narrower the beam, the more accurate the measurement, so the beam will be narrowed to the width of home plate. Ryan, who is sometimes wild, may miss it with his best throw. An interesting side note: Having played my bit part, I recall that the Rockwell device was described behind the scenes as using a "laser beam" as the primary technology. The relatively new and not-yet-understood laser technology created a public relations dilemma. Because it was feared the public may be frightened by an announced use of lasers, the decision was made to use an alternate name. Hence "coherent infrared radar" was a cover for what may have actually been coherent laser radar. Thankfully, there were no reports of severed limbs among the spectators. Notwithstanding the Angels' mediocre play, Ryan continued to break records and grab headlines. Much as Bo Belinsky had done a decade prior, Ryan was keeping the national spotlight on the Angels despite their losing ways. To capitalize on Ryan's growing reputation, Angels publicity director George Lederer arranged a scientific test to be conducted by Rockwell International to discover, once and for all, the true speed of "the Ryan Express." Unlike today's radar guns, the Rockwell machine was precisely calibrated to give an accurate, consistent reading. During a night game against the White Sox on September 7, 1974, an eighth-inning pitch (editor's note: it was actually a ninth-inning pitch) to Bee Bee Richard was clocked at 100.8 miles per hour, eclipsing Bob Feller's unofficial mark of 98.6. The Rockwell test naturally enhanced the Ryan mystique. If players didn't already have enough to worry about when facing the Angels ace, they now had to deal with the scientifically proven fact that they were facing the hardest-throwing pitcher in the history of Major League baseball. Ryan and his batterymate, Tom Egan, felt that all the fanfare, the publicity and pre-game activity was largely responsible for the big pitcher losing his concentration and failing to come up with the velocity he expected. "I've caught him when he threw harder than he did tonight," said Egan. "He didn't have his real stuff. All that activity took away from his concentration." Ryan, who threw 159 pitches, did perk up in the seventh and eighth innings when he registered five strikeouts, but some of his fastest pitches in those innings were not recorded. The White Sox swung at them, but they weren't in the strike zone, the area that fell within the scope of the Rockwell International machine. Following Ryan's next start on September 11, Dan Hafner quoted Ryan: "I had better than average speed tonight. Better than when they tested me. At least, I felt like it out there." "Those were the best pitches I ever heard." So much fuss about one 100 mph fastball. Now, 30 years later, radar guns are recording speeds on virtually every pitch thrown in major league games. The Bill James Baseball Handbook 2006 reports that in 2005 23 pitchers threw a combined 135 pitches at 100+ mph. Baseball Almanac has a 100 MPH Club listing "In Order of Fastest Observed Speed." Two radar gun readings of 103 mph top the list -- by Mark Wohlers from a 1995 spring training game and by Joel Zumaya on July 4, 2006. The list does not include Zumaya's 103 mph reading thrown during the Joe Morgan rant on September 3, 2006. Little Joe adamantly questioned the reliability of radar guns. The scientific precision of the Rockwell measurement creates a strong argument for officially recognizing the Ryan Express as the king of all fastballs. Despite all the fanfare of the 100.8 mph fastball to Bee Bee Richard on September 7, 1974, Nolan Ryan is officially recognized as holding the Guinness World Record at 100.9 mph for one pitch in the August 20 game against Detroit when the Rockwell engineers discreetly tested their system. Contrary to his skepticism of Joel Zumaya's radar readings, perhaps Joe Morgan could be counted on to support his contemporary, Nolan Ryan. "I know a 100.9 mile per hour fastball when I see one and that was a 100.9 mile per hour fastball." Tom Lederer is a former pitcher whose fastball was seen and not heard. His "On the Road With the Dodgers" guest column can be found here. Tom you missed your calling. A very entertaining article. If he was so good, I wonder why Ryan was just a little over .500 pitcher? Excellent history recap covering radar speeds. Growing up in SoCal, we would go to either "Home Run Park" in Buena Park, or to the LeFebre center to hit off batting machines. The cages were sometimes marked "70", "80" or "90", and I remember one in Artesia/Cerritos area marked "100" (but it was mostly under repair and not working). It was always a challenge to get into the faster cages and see how we did. We never knew how accurate the readings were, but it mattered little. Same went for facing a pitcher with more heat than normal. You just knew who could bring it. Nice comment by Charlie Sands regarding 85, but folks, I tell you, Tom was more "Greg Maddux" than "Nolan Ryan", and he was an extremely effective and successful pitcher. I loved Nolie. Knew him well. But, sorry, it's strictly no contest when we're identifying the pitcher who could throw the hardest. His name was Steve Dalkowski, and he was in the Orioles organiation for a dozen years or so while they waited for him to find home plate. I saw him pitch a minor-league game in which he struck out 21 and walked 20. Are Paul Richards and Bobby Bragan still alive/ I did a column on the Ryan fastball test and contacted Richards and Bragan and several others from the Orioles organization about Dalkowski. They all said the same thing -- no contest. Dallkowski was a lefthander. Bragan said he was so wild he once hit a guy in the on-deck circle. And Richards said he threw one over the grandstand screen. You can find quite a bit of Steve Dalkowski stuff on the internet. He's a legend. At the time of the Ryan test, I searched all over for Dalkowski and finally discovered he was in a Bakersfield jail. An alcoholic who was in constant trouble. I believe he's dead. Loel Schrader, Palm Desert, CA (formerly Long Beach Press-Telegram). Not that the record is all that meaningful, but control issues, Walt. I think casual fans tend to remember the no hitters and the Ks but forget he also accumulated almost 1000 more BB than any other pitcher in history. It's why he never finished higher than 2nd in Cy Young voting and his ERA+ is a solid but hardly legendary 112. The wildness was part of Ryan's appeal though, and I can't even imagine what was going through a hitter's mind when he had to step into the batter's box. Craig -- As flattering as it is to be compared to Maddux, I always fancied myself in the mold of Sandy Koufax! In 1977, I estimate his average was 142. My estimate in both cases is probably a few pitches per game low, because of Ryan's unusual combination of high K and high BB. Loel -- Great to hear from you. George Lederer is not the type to engage in excesses or superlatives. But the public relations director of the Angels is excited about an event scheduled Saturday night at Anaheim Stadium. . . . "We've had entries from just about every city in California, including a large number from Long Beach," adds Lederer. "Long Beach ranks third in number of entries behind Los Angeles and Anaheim. We've also received entries from people in towns and cities around the country that I've never heard of. People in the New York area who followed Ryan when he was with the New York Mets seem greatly interested. We have entries from Brooklyn, White Plains, Far Rockaway, Stoneridge and Yonkers. The response has been amazing." Thanks, Loel. I look forward to buying your new USC football book "Fight On!" I believe Steve Dalkowski is still alive; here's an interview with him conducted last year. The joke was on Charlie Sands: HE was the one on the parking lot catching for a 22 year-old that was two years removed from baseball. Didn't hear much about him after that..
By the way, Tom was one of those "sneaky-fast" lefties-(pitching, not running). I think today's radar guns are on steroids. Even soft-tossing middle relievers claim to throw in the 90s. Bobby Bragan is still alive and well in Fort Worth, Texas as he approaches his 89th birthday. I recently interviewed him for Baseball Digest.